The only book challenge that I signed up for this year is the 2016 Graphic Novel / Manga Challenge, and I went for the Modern Age level. This means I need to read and review at least one graphic novel per month. On the reading part, that’s definitely not too difficult to accomplish! The reviewing part is more difficult. I received Vol. 1 of The Wicked + The Divine by Kieron Gillen, Jamie McKelvie (Illustrations), Matt Wilson (Colorist), Clayton Cowles last Christmas and I bought the next two installments right after. I read all three volumes together so I’m consolidating mini reviews of them in this post. Vol. 1: The Faust Act – So many people were gushing about WicDiv and it kept being mentioned whenever I asked for graphic novel recommendations. I was excited to get started on Vol. 1 because I thought the concept for the series was brilliant. I was intrigued when I read the premise, and immediately wanted to find out more about these young men and women who turned into gods, and manifested their powers by performing concerts. They thrived on these performances, and the audience loved them. Kind of similar to how much influence rock stars and pop stars have in the real world, just a little bit more intense. I thought the artwork was gorgeous and reminded me a bit of Jem and the Holograms, one of my favorite animated shows when I was younger. Vol. 1 served as a quick introduction to the series, showing readers a wide range of characters. I enjoyed reading it but I was mostly confused by the time I reached the end. I felt like I couldn’t get a clear grasp of the storyline. Good thing I already had a copy of Vol. 2 with me so I could dive right in. Vol. 2: Fandemonium – Vol. 2 continues with the story that Vol. 1 started and introduced a few more of the gods. I went through Vol. 2 pretty quickly because I wanted to understand what was going on. And yes, I did get some of the answers that I wanted but even more questions were raised. Just when I thought I would finally see everything come together, BAM! Something else happens that I can’t figure out. I know I’m being very vague here but I don’t want to accidentally mention any spoilers. Similar to how I felt when I finished Vol. 1, I wanted the next installment ASAP. I was lucky I started reading these just as Vol. 3 was released. Vol. 3: Commercial Suicide – I was so glad Vol. 3 was readily available in Kinokuniya Singapore. I didn’t have to wait too long to find out what happens next. Going into Vol. 3, I had no clue that the illustrations would be different from the earlier two installments. Each chapter was illustrated by a different artist. While the idea may seem appealing to other readers, I really liked the original artwork and wanted the story to continue in that way. I found the abrupt changes jarring. On top of that, I still felt mostly confused even if I was already in the third book in the series. Sadly, it was a disappointing read for me. I just wasn’t invested enough in the story or the characters. After reading three volumes, my conclusion is that WicDiv isn’t a series for me. There’s too much violence, too many questions, and not enough answers. I wouldn’t have minded the violence if I loved the story, but sadly, that wasn’t the case here. As always, I’m glad I tried something new. 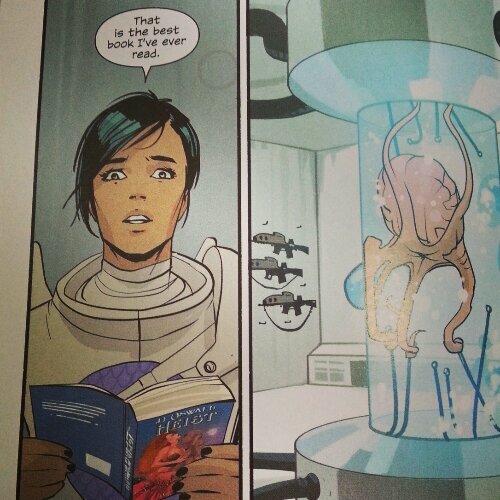 But I’ll be keeping my fingers crossed that I would have a better experience with my March graphic novel read. My very good friend Maggie of Young Adult Anonymous has been raving about the Saga graphic novel series so I’ve been really curious about it. Last Friday, Kinokuniya Books was having a sale and I decided to drop by and see if I could grab any interesting books. 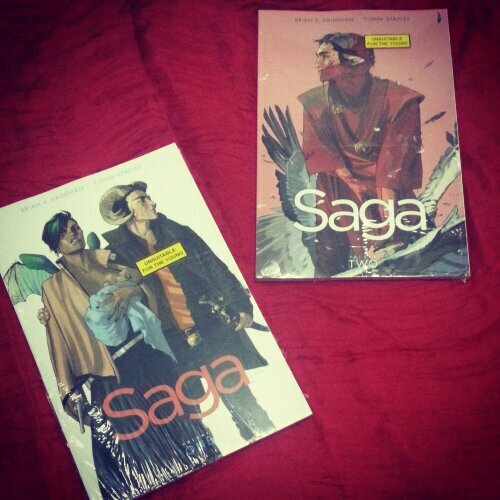 I ended up buying the Saga Volume 1 and Volume 2 since the cost wasn’t too bad after the 20% discount. I found it hilarious that the copies that I got had stickers that said “Unsuitable for the young.” I opened up Volume 1 on Sunday afternoon to try and read maybe one chapter and I ended up finishing it in one sitting. I picked up Volume 2 right after. I was in the middle of other novels but I chose to ignore them in favor of Saga. I’m not really much of a graphic novel reader. I’ve only read a couple of them and I think the only other graphic novel / comic book series that I’ve reviewed on the blog is Trese by Budjette Tan and KaJo Baldisimo. It’s not that I have anything against graphic novels, it’s just that I’m not familiar with what’s out there and I find them a bit more expensive than paperbacks or hardcovers. But I’m usually game to try something that comes highly recommended (or if a friend lets me borrow his or her copy so I could check it out). I’m so glad I decided to give Saga a try because I really enjoyed reading it, it’s now right up there with Trese as my favorite graphic novel series. But again, that’s not saying much since like I mentioned, I haven’t read that many graphic novels. Saga is the story of Alana and Marko, two soldiers from the opposite sides of an ongoing war. These two are from different worlds and different species and yet they find a way to bridge their cultural differences and connect. Even their personalities are poles apart but I feel like they balance each other well – Alana is sassy and quick to anger while Marko is more reserved and is a pacifist. Alana and Marko’s relationship is new and definitely not perfect, they argue and bicker but I love that their conversations are peppered with humor. There were actually some scenes that made me laugh out loud while I was reading. Also, I think it’s awesome that Alana’s favorite book plays a significant role in the story. I think the art also complements the story very well. I feel like it reads like an animated film, with some very unusual creatures and settings thrown in (because of the space opera / sci-fi nature of the story). It never got confusing even though the points of view shifted quite a bit. That’s another thing that I liked about the story – there are people after Alana and Marko, those who oppose their union and think that it will have a huge impact in the war effort. But even these characters are portrayed as complex individuals with their own motivations behind their actions. Like with any kind of war, there are a lot of gray areas instead of clearly defined good versus evil. In a war that has been going on for so long to the point that the fighting has been outsourced, it gets even more complicated. Ultimately, I feel like Saga is about family, relationships and how war affects human interactions. Saga is something that I wouldn’t have picked up if I wasn’t curious about it because of Maggie and another friend IRL who read it about the same time I did. I definitely recommend it to anyone looking for a space opera adventure story with some romance in it. Can’t wait for Volume 3.